Your home doesn’t speak but it tells a lot of who you are and what your tastes are, as do the patios, driveway and walkways that lead to your home and to the outdoors. They create ones first impression of your home and your lifestyle. So, they should be thoroughly planned and designed just as you would do for the interior of your home. 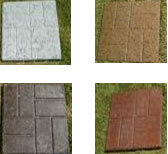 The most important decision to be made is; what type of pavers should I use for all my outdoor flooring applications? In this article we discuss the use of Brick pavers. Adding a brick paved walkway, patio, pathway or driveway to your home can be a great investment and is sure to add value and a sense of style to your property. Antique brick pavers offer a rustic and ‘old world’ appearance. They require careful installation which is suggested to be carried out by a professional. This is due to their delicacy and soft texture. They offer many benefits and are cost effective because they are being made in imitation forms out of 50 year old machines. Antique pavers are suited to several applications like; driveways, patios, walkways, entrances and courtyards. They require little maintenance and there are specific types of cleaners that are available to assist you with their maintenance. Brick pavers are made of 3 primary elements known as clay, water and fire. The firing process is conducted to bind the pavers together. Shale and silica are also formed in brick pavers. Genuine brick pavers will offer you a touch of class and elegance. Their installation is simple and can be carried out by yourself or a skilled professional. Maintenance is not a problem, every so often wash them down with a high pressured hose and use a specific cleaner to remove harsh stains. One of the beauties of brick pavers is that they can be made to match the ones used on your home if needed, how wonderful! Their appearance gets better with age. There are many laying patterns to choose from. You can create your own laying pattern interlocked or not. They can be custom made to the shapes you require. Do not need to be applied to mortar it’s your choice. No two bricks are alike in color or texture. Antique brick pavers offer a soft look that can’t de duplicated. These are 2 of the main attributes pavers should have. There are special standards that brick pavers need to meet. They have to be able to withstand both foot and vehicular traffic. Most brick pavers meet this standard so it is important you question this topic before purchasing brick pavers. See, house and wall brick are different to the brick pavers used for flooring. If you install brick pavers that don’t meet these special requirements it may result in damages. Brick pavers are resistant to most types of stains. Some harsh stains like petrol and oil should be removed straight away with special brick pavers cleaner. Efflorescence may occur and disappear over lengths of time. Efflorescence is a white powdery substance that is seen on the surface of the pavers. To avoid efflorescence do not use calcium chloride de-icers. To ensure that you get the best out of your Brick Pavers it is recommended that you become an expert and well informed on the topic, ask questions and do a little research. Brick pavers are not one of the most commonly used pavers for no reason! This entry was posted in Benefits of Pavers, Paver vs. Concrete, Types of Pavers and tagged brick pavers. Bookmark the permalink.